The city of Kirkland, Washington, has filed an appeal to the Superior Court of Washington in King County to reinstate domestic violence charges against Hope Solo. In January, a judge dismissed domestic violence assault charges against the U.S. women's national team goalkeeper a week before the case was set for trial. Within weeks of the case being dismissed, prosecutors turned around and, in a rare move that required city approval, appealed the ruling. 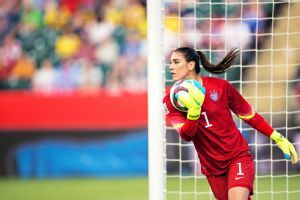 Hope Solo could face domestic violence charges again if the city of Kirkland, Washington, wins its appeal to reinstate the case. The city laid out its argument in a Friday filing. Solo had been charged with two misdemeanor counts of fourth-degree assault stemming from an altercation with her half-sister and 17-year-old nephew in June 2014. Kirkland Municipal Court Judge Michael Lambo dismissed the charges on Jan. 14 over procedural issues in addition to the fact that the alleged victims did not show up for a court-ordered second set of depositions. "I always had faith that once the facts of the case were presented, I would be cleared of all charges and I am so happy and relieved to finally have it all behind me," Solo said in a statement when the charges were dismissed. In its appeal, the city said the prosecution had acted diligently and that there were no allegations of misconduct. It said the actions did not affect Solo's ability to have a fair trial. The decision to drop the charges was an incorrect judgment by Lambo, the city argued in asking that the charges be reinstated.